Six finalists have been chosen for the 2016 Young Designer of the Year Award, after a long day of deliberation by our esteemed panel of judges. 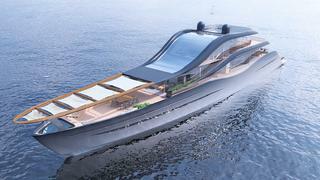 The 2016 task asked young designers to expand a concept for a 45-metre motor yacht into a fully thought-out design that included the deckhouse (or deckhouses) and a complete general arrangement plan for the cockpits and all enclosed spaces. Baoqi **Xiao**’s entry, pictured above, is influenced by the structure of knitwear fabric. The shape of threads interlocking with each other, and the zig-zag pattern of knitwear fabric have both been highlighted by Baoqi Xiao in his entry. “The zig-zag pattern has been enlarged and assigned colour to become an iconic design language in the fashion industry,” he explains. “The zig-zag shape feature is the main styling design language of this concept.” Baoqi Xiao’s Young Designer of the Year Award entry includes the general arrangement, which features good use of outdoor space. The beach club on the lower deck leads up to the main deck, where outdoor seating has been placed by a teppanyaki grill. The interior is also interesting – the upper deck is designed solely for the owner’s cabin, with access into the cinema below on the main deck. Aft sits the main saloon, with guest cabins forward. The lower deck features a spa and sauna, with the rest of the space dedicated to the crew. Baoqi Xiao is currently studying automotive and yacht design at Art Center College of Design in Pasadena, California. Six finalists have been chosen for the 2016 Young Designer of the Year Award, after a long day of deliberation by our esteemed panel of judges. 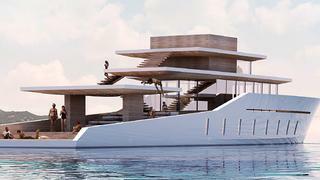 The 2016 task asked young designers to expand a concept for a 45-metre motor yacht into a fully thought-out design that included the deckhouse (or deckhouses) and a complete general arrangement plan for the cockpits and all enclosed spaces. Baoqi Xiao’s Young Designer of the Year Award entry includes the general arrangement, which features good use of outdoor space. The beach club on the lower deck leads up to the main deck, where outdoor seating has been placed by a teppanyaki grill. The interior is also interesting – the upper deck is designed solely for the owner’s cabin, with access into the cinema below on the main deck. Aft sits the main saloon, with guest cabins forward. The lower deck features a spa and sauna, with the rest of the space dedicated to the crew. Baoqi Xiao is currently studying automotive and yacht design at Art Center College of Design in Pasadena, California. Lujac Desautel’s Young Designer of the Year Award entry has maximised outdoor space by introducing public and private areas for the owner and guests to enjoy, held on cantilevering terraces that are layered on top of each other. “Portofino is recognised for its villas set against the turquoise Mediterranean sea and the generous outdoor areas etched into the hillsides. These architectural nuances are an inspiration for the type of lifestyle the owner desires on her yacht,” Lujac Desautel explains. “The result is a layering of spaces: terraces of varying sizes create an interplay between living indoors and outdoors and the necessity of flexible spaces for the company of guests on board. Each terrace has a unique shape lending itself to diverse uses such as an open air cinema, diving board, outdoor living room, fitness area, dance floor, or even a fashion show. Most importantly, Le Petit Terrasse is about creating a home on the water.” Lujac Desautel studied has a BArch from the School of Architecture at the California College of the Arts in San Francisco, California. Desautel spent three summers working on board superyachts and has interned at Pastrovich Studio, amongst other internships. Lujac Desautel’s Young Designer of the Year Award entry has maximised outdoor space by introducing public and private areas for the owner and guests to enjoy, held on cantilevering terraces that are layered on top of each other. “Portofino is recognised for its villas set against the turquoise Mediterranean sea and the generous outdoor areas etched into the hillsides. These architectural nuances are an inspiration for the type of lifestyle the owner desires on her yacht,” Lujac Desautel explains. Lujac Desautel studied has a BArch from the School of Architecture at the California College of the Arts in San Francisco, California. Desautel spent three summers working on board superyachts and has interned at Pastrovich Studio, amongst other internships. Leah Gowoon Park took inspiration from the sweeping lines of dresses presented on catwalks and has incorporated this into her monochrome design – very fitting for the fashion designer client. Leah Gowoon Park’s Young Designer of the Year Award entry features an outside area with sun loungers on the fly deck that – like all outdoor areas aft – is enclosed in glass. An outdoor dining area sits below on the upper deck, with a pool house situated on the main deck and stairs leading down to the beach club and swim platform on the lower deck. Inside, Leah Gowoon Park has devoted significant space on the main deck for a master cabin with a huge dressing room and a five-person cinema. The upper deck main lounge lies above whilst two guest cabins, a health spa and beauty salon can be found on the lower deck. The crew have been squeezed forward of the lower deck. Leah Gowoon Park is studying transportation design at Art Center College of Design in Pasadena, California. Leah Gowoon Park took inspiration from the sweeping lines of dresses presented on catwalks and has incorporated this into her monochrome design – very fitting for the fashion designer client. Leah Gowoon Park’s Young Designer of the Year Award entry features an outside area with sun loungers on the fly deck that – like all outdoor areas aft – is enclosed in glass. An outdoor dining area sits below on the upper deck, with a pool house situated on the main deck and stairs leading down to the beach club and swim platform on the lower deck. Inside, Leah Gowoon Park has devoted significant space on the main deck for a master cabin with a huge dressing room and a five-person cinema. The upper deck main lounge lies above whilst two guest cabins, a health spa and beauty salon can be found on the lower deck. The crew have been squeezed forward of the lower deck. Leah Gowoon Park is studying transportation design at Art Center College of Design in Pasadena, California. The Young Designer of the Year Award entry from Ben Hills has included space on the forward deck for a catwalk – perfect for the fashion designer client. 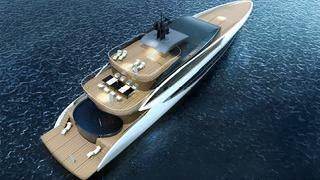 Ben Hills has named each deck of the concept after its purpose: there’s the catwalk deck (upper deck), which includes a dressing room and beauty salon with a large exterior dance floor aft. Above is the DJ deck, with a DJ deck, Jacuzzi and sun loungers. The main deck has the owner’s suite forward, with a design studio starboard that has floor to ceiling glass, and an informal saloon and cinema in the centre aft. Behind this space lies the green room – convertible indoor/outdoor space with weather-tight doors. The relaxation deck boasts a relaxation spa aft, with a sauna, massage suite, steam room and beach club. Two guest cabins sit forward, with two crew cabins further ahead. Ben Hills is a recent graduate from Coventry University with a degree in automotive and transport design. He currently holds a full time position at Bannenberg and Rowell. The Young Designer of the Year Award entry from Ben Hills has included space on the forward deck for a catwalk – perfect for the fashion designer client. Ben Hills has named each deck of the concept after its purpose: there’s the catwalk deck (upper deck), which includes a dressing room and beauty salon with a large exterior dance floor aft. Above is the DJ deck, with a DJ deck, Jacuzzi and sun loungers. The main deck has the owner’s suite forward, with a design studio starboard that has floor to ceiling glass, and an informal saloon and cinema in the centre aft. Behind this space lies the green room – convertible indoor/outdoor space with weather-tight doors. The relaxation deck boasts a relaxation spa aft, with a sauna, massage suite, steam room and beach club. Two guest cabins sit forward, with two crew cabins further ahead. Ben Hills is a recent graduate from Coventry University with a degree in automotive and transport design. He currently holds a full time position at Bannenberg and Rowell. Marlene Ratajska’s Young Designer of the Year Award entry features clear sides to encourage guests to interact with the surrounding sea. The upper deck houses the owner’s suite and owner’s deck, both of which have the best views from the yacht thanks to the glass walls. Below, on the main deck, lies the dining area and teppanyaki grill aft, with two spas, a saloon and a beauty salon indoors. 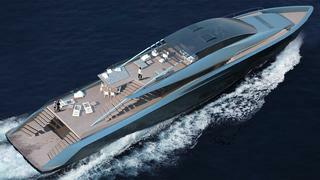 Forward is the outdoor dining and entertainment area with a cinema and a Jaccuzi nestled in the nose of the bow. Aft of the lower deck is a swim platform and beach club. The centre of the lower deck is reserved for crew, with two guest rooms, a gym and sauna forward. “All the shapes around us give the spectrum of possibilities to create unique design,” explains Marlene Ratajska. “Zesa yacht connects exceptional styling with functionality and comfort in cruising.” Marlene Ratajska is currently studying for a masters degree at the faculty of architecture and urban planning at Gdansk University of Technology. She has interned at naval architecture studio Pracownia Propocji, amongst other internships. Marlene Ratajska’s Young Designer of the Year Award entry features clear sides to encourage guests to interact with the surrounding sea. The upper deck houses the owner’s suite and owner’s deck, both of which have the best views from the yacht thanks to the glass walls. Below, on the main deck, lies the dining area and teppanyaki grill aft, with two spas, a saloon and a beauty salon indoors. 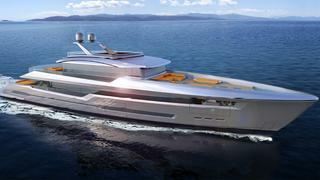 Forward is the outdoor dining and entertainment area with a cinema and a Jaccuzi nestled in the nose of the bow. Aft of the lower deck is a swim platform and beach club. The centre of the lower deck is reserved for crew, with two guest rooms, a gym and sauna forward. Marlene Ratajska is currently studying for a masters degree at the faculty of architecture and urban planning at Gdansk University of Technology. She has interned at naval architecture studio Pracownia Propocji, amongst other internships. The Young Designer of the Year Award entry from Dave Rowles has maximised outdoor space. The upper deck has a huge outdoor space with comfortable seating and dining area, with adjustable bris-soleil to provide extra shade when needed. Below, aft of the main deck, there is a generous outside seating area that can be transformed into an outdoor cinema. Indoors lies the main saloon, with the owner’s suite, spa and sauna forward. 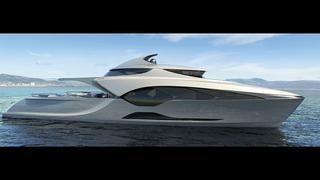 On the lower deck there’s a swim platform, a toy garage, tender garage and accommodation for guests and crew forward. “The design of the exterior is representative of the Milano fashion industry: bold, trend-setting and contemporary,” Dave Rowles explains. “Utilising the original layout designed from the brief I was able to design something low and open – at this size not really seen before.” Dave Rowles is an automotive design graduate from the University of Coventry. He has interned at Feadship and is now working full time for Pastrovich Studio. The Young Designer of the Year Award entry from Dave Rowles has maximised outdoor space. The upper deck has a huge outdoor space with comfortable seating and dining area, with adjustable bris-soleil to provide extra shade when needed. Below, aft of the main deck, there is a generous outside seating area that can be transformed into an outdoor cinema. Indoors lies the main saloon, with the owner’s suite, spa and sauna forward. On the lower deck there’s a swim platform, a toy garage, tender garage and accommodation for guests and crew forward. Dave Rowles is an automotive design graduate from the University of Coventry. He has interned at Feadship and is now working full time for Pastrovich Studio.